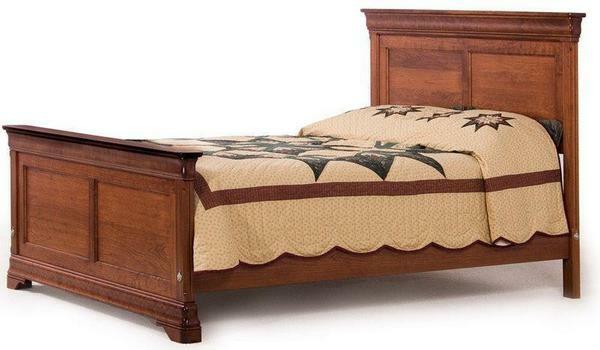 This heirloom quality bed is handmade in the heart of Amish Country! The Solid Wood Le Chateau Panel Bed has a high headboard and uniquely designed lower footboard. The headboard and footboard both have four raised panels to add style to your bedroom suite. This Amish bed is one of the best in our Amish Bedroom Furniture Collection. It is available in oak, cherry or maple wood. You can also choose your favorite finish along with your choice of varnish and distressing to fully customize your selection. Don't hesitate to call us at 1-866-272-6773 to speak with one of our Amish Furniture specialists with any questions. We are here for you and eager to help out in any way we can. We look forward to hearing from you soon!